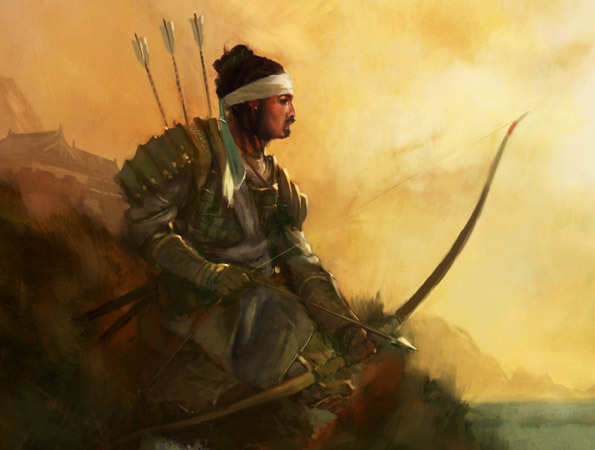 With the death of Doji Okimoto during the previous session of our L5R game I’ve had to come up with a new character that would fit with the shift of the game from being yoriki to an Emerald magistrate to defenders of the Kaiu wall. To make matters even more complicated I’ve decided to play a ronin, quite a shift from the polite and honourable Okimoto. The Morashi family have been ronin for almost 200 years after an ancestor decided that the Gaijin weapon known as a musket would be an ideal weapon to combat the monsters of the shadowlands. After smuggling the weapons into Rokugan he led a small group of samurai into the shadowlands, intending to hunt down the largest oni they could find. Unprepared and unfamiliar with the new weapons the group was slaughtered. The family’s shame, however, was compounded when a Crab patrol discovered the massacre and the report returned to the Clan representative at the wall. The remaining members of the family were immediately made ronin to atone for their actions. Generations later they have taken the name of Morashi, severing all ties to their former Clan. Morashi Kosaku is the latest to follow what has become a long tradition within the family, to leave his family behind and offer his services to the Crab in the hope of regaining his place in the celestial order.What he wasn’t aware of until recently is that each generation the eldest child of the family is driven to this duty by Tsuruchi Satsuki, who was made ronin after her father’s ill fated expedition into the Shadowlands.Unable to reclaim her position within the celestial order during her own lifetime her restless spirit has haunted her descendents, driving them into the darkness of both the Shadowlands and their own past. Having known no life other than that of the ronin Kosaku is a pragmatic and driven individual, willing to sacrifice his personal honour even as he seeks to regain the honour of his family. Extremely basic medical kit (bandages made from rags, herbs etc). This is mostly to hide his Gajin pepper, if questioned Kosaku claims the pepper is for preventing wounds from becoming infected (apparently gunpowder was (IRL) occasionally used for this though I doubt it was actually effective). Given the simplicity of the kit I assume it will make actual medicine rolls harder until I can acquire a full kit.